In 2019, political and trade drama will probably continue to generate short-term noise in the markets, but economic trends (not market ups and downs) ultimately determine medium and long-term returns. If you chose the right risk level, short-term volatility is not something that should worry you. If it does bother you, then the risk you’re taking is too high. 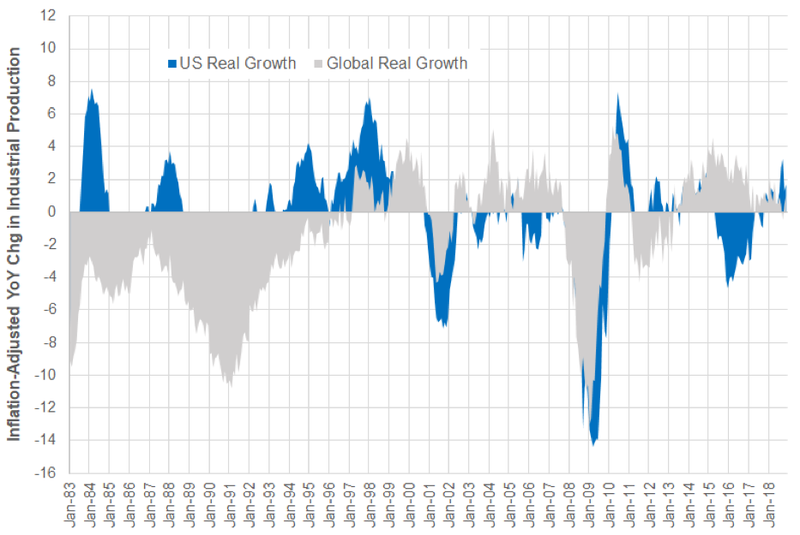 Inflation-adjusted growth in the US continues to perform better than the global aggregate. This means that investors should continue to invest internationally and will need a sufficient amount of US-based assets to enhance the staying power of their portfolios. A closer look at the last two bear markets reveals that they didn't happen when the yield curve is flat (or inverted). Instead, these bear markets actually happened when the yield curve stopped flattening and “re-steepened” after the inversion! 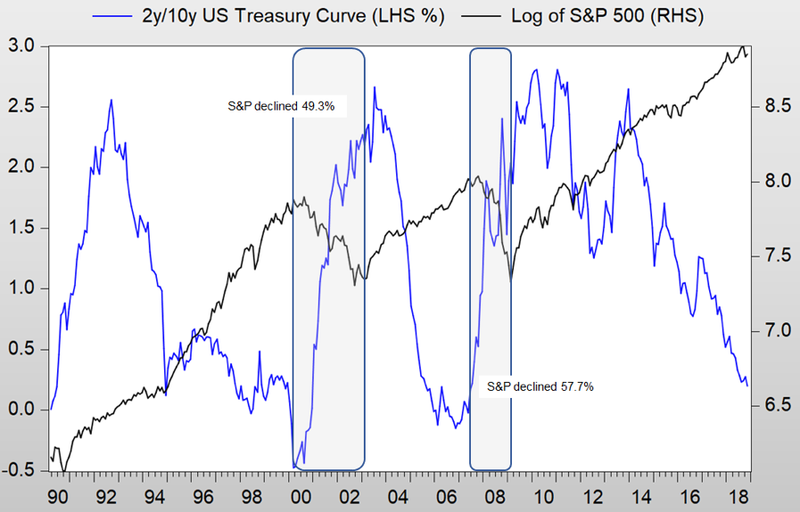 The reality is that past economic cycles have shown us that yield curve inversions were not a reliable recession timing tool: stocks can continue to climb substantially and for a long time well after the inversion. Two stock market corrections in a single year pretty much summed up 2018's investing environment. Much of the market volatility has been generated by never-ending geopolitical drama. Beyond trade tensions, there are also geopolitical uncertainties such as Brexit, the ongoing budget tension between the EU and Italy and calls for sanctions on Saudi Arabia after the murder of journalist Jamal Khashoggi. Towards the end of November, many commentators were expecting trade tensions to ease and to give to the markets the confidence they needed. In fact, a 90-day truce was struck when Trump and Xi met on the sideline of the G20 summit in Argentina on 1-2 December. The US promised to put on hold any further increases in tariffs, and China would restart its purchases of liquefied natural gas, soybeans, and corn from the US. This was supposed to be a positive development that the markets should have been happy about. Unfortunately, a lack of coordination amongst Trump’s aides has resulted in vague communications to the public, leaving the wary market more confused than enlightened. Moreover, when clearer details about the truce were finally communicated, the ceasefire was immediately put at risk when Huawei’s CFO Ms Meng Wanzhou was arrested in Vancouver for allegedly violating American sanctions on selling technology to Iran. Fortunately, China treated the issue as separate from the trade disputes, and has continued with the trade negotiations with the US. China has also gone a step further to defuse tension by removing retaliatory duty on US automobiles. In 2019, political and trade drama will probably continue to generate short-term noise in the markets but economic trends ultimately determine medium and long-term returns. Long-term investors should continue to focus on macroeconomic data. In particular, inflation-adjusted growth (otherwise known as “real” growth) is a very important gauge. As can be observed in Figure 1, inflation-adjusted growth in the US continues to perform better than the global aggregate. This means that investors should continue to invest internationally but will need a sufficient amount of US-based assets to enhance the staying power of their portfolios. Notes - nominal growth is proxied by yoy percentage change in the industrial production of a country. Real growth is derived after adjusting these figures for headline CPI inflation. The global aggregate is a proprietary index created by StashAway, and includes countries such as Brazil, China, Denmark, Europe, India, Japan, Mexico, Norway, Poland, Russia, Singapore, South Korea, South Africa, Sweden, Taiwan, Turkey, United Kingdom, and the United States. As we have reiterated repeatedly throughout 2018, leading indicators on the US economy (particularly the Conference Board LEI) suggests stronger momentum, and the US economy has continued to outpace global growth. This has lent more support to growth-oriented assets in the US, and they have performed better than other regions. 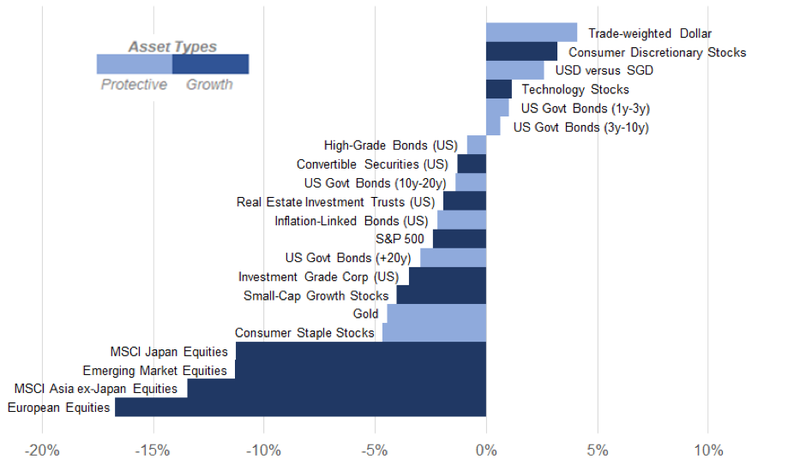 Figure 2 shows the YtD total returns (before fees) of some of the asset classes we’ve tracked throughout the year. The chart is based on the closing data on 18 December. Growth-oriented assets are indicated by dark blue, and protective assets by light blue. The best performers among growth-oriented assets are stocks in the US consumer discretionary and technology sectors. As of 18 December, they have gained YtD returns of +3.2% and +1.2%, respectively. While these returns are a far cry from the double digit gains in 2017, they are significantly better than the ones achieved by equity markets in Japan, Emerging Markets, Asia ex-Japan, and Europe where YtD returns range from -16.7% to -11.3%. These regions have a large dependency on China, so understandably have reacted more negatively to the existing slowdown in China that was worsened by this year’s trade war. The US dollar outperformed with a +4.1% YtD gain on trade-weighted basis, and a 2.6%. In fixed income, investors tend to think that short-term government bonds should bear the brunt of a rate hike cycle. In 2018, short to intermediate-dated US government bonds actually managed to return +1.0% (SHY, 1-3 years maturity) and +0.6% (VGIT, 3-10 years maturity) despite three 0.25% rate hikes by the Fed. As interest rates go up, bond investors initially lose in terms of negative price returns, but higher rates also mean that they are earning higher income. As long as the pace of rate hikes is gradual, higher income can offset negative price returns. The shadow of the rate hike cycle did however weigh on longer-term US government bonds with TLH (10-20 years maturity) and TLT (>20 years maturity) delivering -1.4% and -3.0%, respectively. As an asset class, corporate bonds were besieged by Fed’s liquidity withdrawal and the uncertain international trade environment. As a result, investment grade corporate bond as a sector (LQD) also underperformed with a YtD return of -3.5%. Finally, consumer staples stocks underperformed with a -4.7% YtD returns, despite the sector being traditionally considered one of the safest corners of the stock market because it consists of non-cyclical companies that manufacture or sell essential consumer goods. The underperformance could be attributed to the new complexities the trade war has introduced: to investors, it’s unclear as to whether consumer staples companies will have the ability to pass on the cost of tariffs to customers. Before we answer the $10 question “are we entering a bear market?”, let’s first unpack the misguided fears around a flattening yield curve. The yield curve is a plot of bond yields against the amount of time they have until they mature. If one plots the yields of government bonds against time to maturity, the plot is known as a government bond yield curve. We can also plot the yields of other classes of bonds to obtain yield curves for investment grade and high yield corporate bonds. Economic theory suggests that a very flat (or inverted) yield curve could lead to a recession, and this has become quite a hype in the media. When the yield curve is very flat or inverted, lenders have fewer incentives to make long-term loans because the returns in doing so are low relative to the their cost of capital (which is indexed to short-term deposit rates). As a result, banks tend to tighten their lending standards. This, in turn, shuts out a lot of borrowers from the credit market, and could be negative for economic activities. Let’s take a look at some data in Figure 3. Over the last 18 years, we have witnessed two major bear markets for equities. The first bear market took place after the bursting of the US technology bubble (March to October 2000), when the Nasdaq Composite and the S&P 500 declined by around 78.4% and 49.3%, respectively. The other bear market happened during the housing market crisis of 2008. During that time, the S&P 500 declined by around 57.7% between November 2007 and March 2009. A closer look reveals that these bear markets did not happen when the yield curve flattens. Instead, these bear markets actually happened when the yield curve stopped flattening and “re-steepened” after the inversion! The reality is that past economic cycles have shown us that yield curve inversions were not a reliable recession timing tool: stocks can continue to climb substantially and for a long time well after the inversion. Taking these signals too literally can be costly to investors. The right yield curve to look at is a plot of the market’s expectation on Fed’s interest rate over time. This is known as the Fed funds curve, and when it slopes upward, that means that the economy is doing well enough that the market thinks rate hikes are justified. When there is a lack of confidence in the economy, the market will start to anticipate rate cuts from the Fed to smooth out the path of the economy. In this case, the Fed funds curve could invert. As this situation is recessionary in nature, growth-oriented assets tend to underperform. In other words, the Fed funds curve is a forward-looking indicator of the economy. At the time of this writing, the Fed funds curve is pricing in a 0.25% rate hike by June 2019. 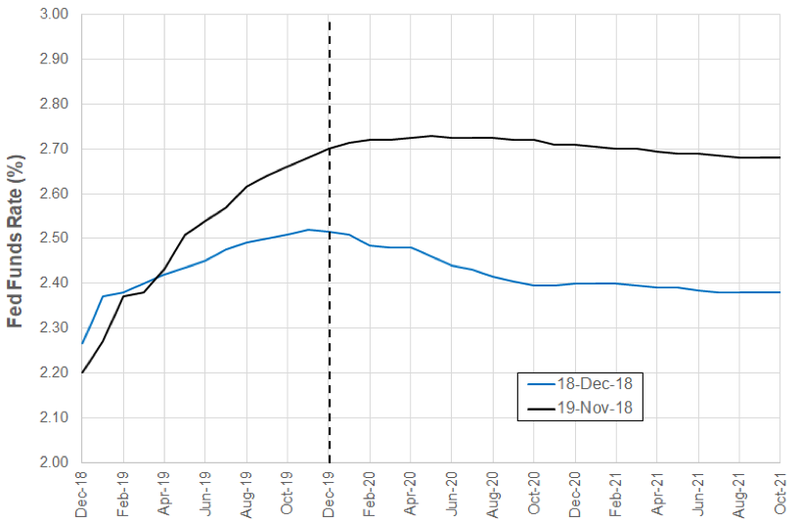 In addition, there is also a 26% chance that the second rate hike could be delivered by December 2019 (Figure 4). This expectation is less aggressive than what we have observed on 19 November when two full rate hikes by December 2019 were priced in. So the market has pared back its earlier confidence about the economy to a more measured level. The Fed funds curve is far from being inverted and should not be confused with an expectation for a recession. What you need to know is that the market is lowering its expectations on the returns of growth-oriented assets in 2019. This is healthy as it reduces the risk of future earnings disappointment. It also means that market valuations are fairer. It is important to keep in mind that portfolios should continue to be diversified and have a sufficient amount of protective assets, such as US government bonds, high quality corporate bonds and gold. The slower expected pace of rate hikes helps these protective assets function more effectively as shock absorbers for a portfolio. What should investors do (or not do) in 2019? The most important thing to navigate volatile markets is to stick to your plan. Don’t try to time the market, but rather, invest systematically (e.g., monthly) through standing instructions, and confirm that the risk level you have chosen is right for you and does not disturb your sleep! How can you stick to your plan? Ignore the media and maintain a long-term mindset. If it’s up to the media, there will always be an endless list of things to worry about. Maybe 2019 will be a good year for growth-oriented assets. Maybe not. Maybe market volatility will continue to stay at similar levels as 2018. Maybe not. Maybe Trump is going to be impeached in 2019. Maybe not. The thing to remember as we enter the new year is that none of these worries are new. They have been talked about before and have always been there, and will stay. As long as you have a long-term mindset, and your risk level is set correctly, short-term volatility is not something that should worry you. If it does bother you, then the risk you’re taking is too high. The beauty of advanced investment technology is that it is easy to review and edit your investment goals. The less beautiful part is that by being able to check our performance on any particular day, we can forget to look at the bigger picture: how much risk we’re taking to reach our returns as we navigate the same volatile market that the rest of the world is also navigating. ERAA® is designed to navigate market ups and downs by looking at what matters: macroeconomic data. As long-term investors, we should continue to focus on economic data and not allow hearsays and naysay derail us from our investment plans. As 2018 comes to a close, I would like to wish you happy holidays. Looking ahead, I am personally very excited about the stream of innovations the StashAway team has in store for you and how they will further enhance the way you make the most of your investments in 2019 and beyond.